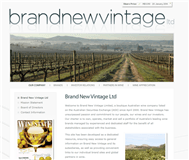 Welcome to Brand New Vintage Limited, a boutique Australian wine company listed on the Australian Securities Exchange (ASX) since April 2000. 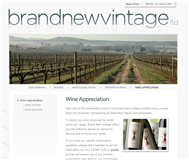 Brand New Vintage has unsurpassed passion and commitment to their people, their wines and their investors. 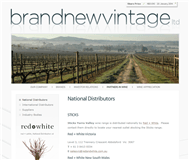 Their charter is to own, operate, market and sell a portfolio of Australia's leading wine brands managed by experienced and dedicated staff for the benefit of all stakeholders associated with the business. To develop an innovative boutique wine company listed on the Australian Securities Exchange (ASX), focused on selling premium wine brands demanded by the world and backed by quality assets for the long term benefit of all shareholders. 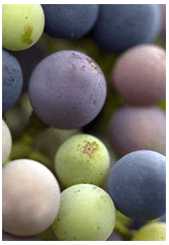 One Planet is a boutique wine company consisting of premium wines from world renowned wine regions, packaged in a convenient and environmentally friendly prisma pack. Their philosophy is simple; they believe 'every one can make a difference'. One Planet was born after a long lunch with wine industry specialist Sam Atkins and his friends and colleagues, winemakers and husband and wife team, Tim and Sarah Burvill (nee Fletcher). Looking over Sam's Estate Vineyard in the Adelaide Hills, enjoying good food and great wine, the conversation turned to the state of the planet and how to make a difference for their children's future, whilst continuing their passion for making and selling premium wine. There and then they decided this was a mountain they were willing to climb and after two years of extensive research into alternative wine packaging, name and design development, endless debates and frustration abound, One Planet was launched in December 2009. 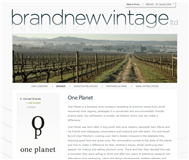 Please visit oneplanetwine.com to read more about the One Planet range and about the environmentally sustainable benefits it has to offer. One Planet Cellars is located in the picturesque Adelaide Hills, just 30 minutes up the freeway from the Adelaide CBD and is open 7 days a week from 10.30 - 4pm. Please come and taste the One Planet range along with the additional wines crafted by Tim and Sarah, Rockbare and Alta Vineyards. Sticks Yarra Valley is beautifully situated on a single site in the picturesque Yarra Valley, an hour's drive from Melbourne. The Winery and Cellar Door, which are nestled in to the base of the Christmas Hills, have unparalleled views of the Estate vineyard and Great Dividing ranges. It is here that winemaking operations are carried out, making Sticks one of the largest and most progressive wineries in the valley. Producing award winning wines that are sold both nationally and in key markets around the world, Sticks Yarra Valley wines express true varietal characteristics. Founder and iconic winemaker Rob 'Sticks' Dolan is dedicated to producing exceptional cool climate wines that are eminently fresh, fruit driven wine styles showing depth and regional expression. Standing at six foot six, Rob Dolan was given the nickname 'Sticks' during his days as a dual premiership player for the Port Adelaide Aussie Rules Football Club. Rob has pulled together a young, vibrant and highly regarded winemaking team who are as passionate about the sticks in the vineyard as Rob is about his footy!